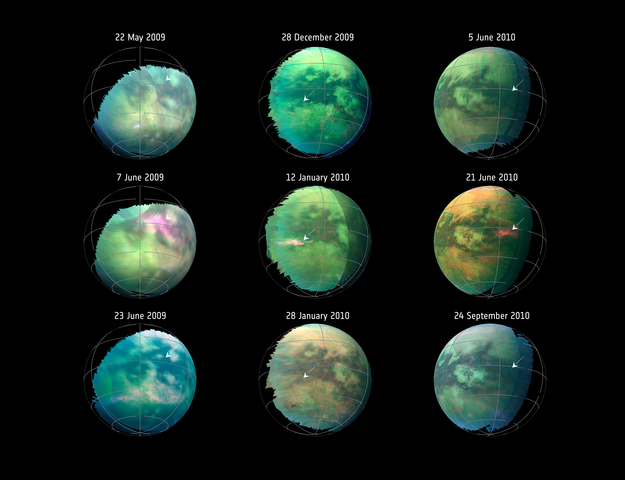 This compilation of images from nine Cassini flybys of Titan in 2009 and 2010 captures three instances when clear bright spots suddenly appeared in images taken by the spacecraft's Visual and Infrared Mapping Spectrometer. The brightenings were only visible for a short period of time – between 11 hours to five Earth weeks – and cannot be seen in previous or subsequent images. By analysing the infrared spectra of these images, researchers found that these spots were most likely large clouds of dust raised from Titan's dune fields. It is the first time that dust storms have been observed on Titan, making this intriguing moon of Saturn only the third body in the Solar System featuring an active dust cycle, after the Earth and Mars.